The first Tammy to feature credits has recently had an entry on this blog. Now the last Tammy to have credits will be profiled as well. Since the credits started, they have evolved and changed, sometimes in odd ways. Some of the credits were pseudonyms. For example, Tony Coleman was credited under his own name at first, but he was subsequently credited as George Anthony, as he is here. Some writers and artists did not appear under their full name. For example, the DCT artist who draws “Event of the Year” is only credited as “Raymond” (is that his first or his last name?). Julian Vivas, who draws “Julie’s Jinx”, is just credited as “Vivas”, but his full name appears in other Tammy credits. Reprints were not credited, as was the case with “My Terrible Twin” here. Even the artist, Juliana Buch, is not credited, as she was for her new stories in Tammy. Features, such as the one about footwear on the back cover, also received credits. But it is not clear whether Mari L’Anson is the writer, the artist or both for it, because the credit just says “by: Mari L’Anson”. When the credits first began, Roy Preston was credited with a lot of stories that had dark, supernatural themes such as “The Evil One” and “Sign of the Times”. These were probably leftover scripts from “Monster Tales” in the Tammy and Jinty merger. Preston continued to be credited with several complete stories that had a supernatural theme, such as “The Lady of Ranoch Water” and “The Moon Maiden”. But here Preston is credited with a lighter story that has no supernatural theme whatsoever: “Event of the Year”. Throughout the credit run, Preston wrote only complete stories; there is not a single serial attributed to him during this period. Ian Mennell is credited with several mystery stories, such as “Foul Play” and “Saving Grace”, but the credits also show he was not solely confined to that genre. 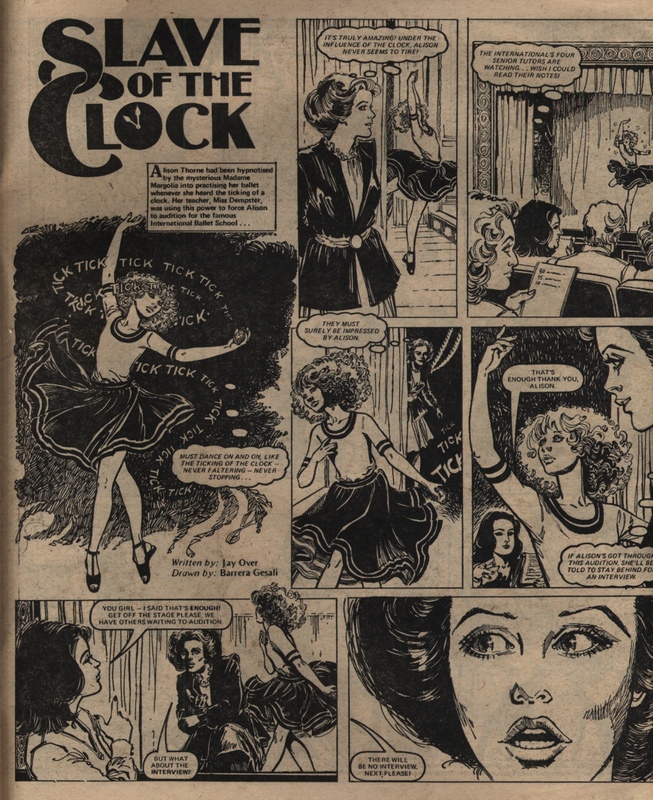 Mennell wrote the unorthodox male cross-dressing story “Cuckoo in the Nest” and a lot of Button Box stories, such as the one in this issue. Alison Christie, who first started Button Box, did not write all of its stories; Mennell and Linda Stephenson are also credited with Button Box stories. This is unlike the case of “Pam of Pond Hill”, where Jay Over is credited as the writer throughout. Alison Christie remains credited with emotional stories such as “A Gran for the Gregorys” and “It’s a Dog’s Life!” throughout Tammy’s credit run. There were no stories with a more supernatural or sporty theme attributed to Christie, though her interviews revealed that she sometimes delved into those genres in Jinty. And here Christie begins her last credited Tammy story “Cassie’s Coach”. This is a Victorian-set struggle for survival after the mother is wrongly imprisoned. Her children take up the most unusual accommodation after they are thrown out of their old home – a discarded coach! Cassie is not quite as intense or disturbing as some of Christie’s emotional stories. This is probably why Tony Coleman was the choice of artist for a period story, something he does not normally draw. Can a computer program help us identify unknown writers? I don’t know yet, but I’m going to give it a go. And I’ll need a little help from others, please. Can any one help by typing up one or more episodes from the stories mentioned, and sending them to me? I’m working out a standard format to use, because it’s going to be important to be consistent about things like how to indicate thought balloons or the text boxes at the beginning of each episode. We can work that out further together of course. Very many thanks in advance! Once I have enough example files to start running them through the program, this is what I am intending to try (any comments or suggestions will be received with interest). Can I get the program to work at all? If I load a credited Jay Over text as a Known Author, and a Pat Mills story likewise as a Known Author, will an episode of “Slave of the Clock” be successfully identified as a Jay Over story? What if I then compare a credited “Pam of Pond Hill” story – will the program identify this as a Jay Over story, or will the comedy style mean it is not as recognisable to the program? What if I then compare an uncredited “Pam” story with a credited “Pam” story? We think all the Pam stories were written by Jay Over but could this program show us any other views? What if I then add in more Known Authors and re-run the tests above – will the results still come out the same? If I compare an episode of “Prisoner of the Bell” to “Slave of the Clock”, does the former look like the known Jay Over texts? If I compare an episode of “E. T. Estate” by Jake Adams to the uncredited story “The Human Zoo”, what does the program indicate about any plausible attribution? We think Benita Brown probably wrote “Spirit of the Lake” – is there any textual / stylistic similarity we can find between this and “Tomorrow Town” that we know she wrote? Of course no stylistic attribution program is going to replace a statement from a creator or a source from the time, but we know these are thin on the ground and getting thinner, and what’s more people’s memories and records are getting more fragmentary as time goes by, so this seems worth trying. I don’t expect anything to happen very quickly on this because it does mean quite a bit of typing to get a good body of texts. If anyone is able to help on the typing front then I will be very grateful and hopefully will then be able to show any results sooner rather than later. But I can add in extra detail such as the description that the text appeared in a word balloon, if I have a scan of the pages in question. Two new stories begin in this issue. The first, which went on to become one of Jinty’s classics, is “Almost Human”. An alien girl, Xenia, is left to fend for herself on Earth because her own planet is facing ecological catastrophe. But Xenia soon discovers that her alien touch is deadly to any life form on Earth. Talk about being the Untouchable! The second, “Mike and Terry”, is the Editor’s response to a recent competition in which readers were asked for what they especially wanted in Jinty. 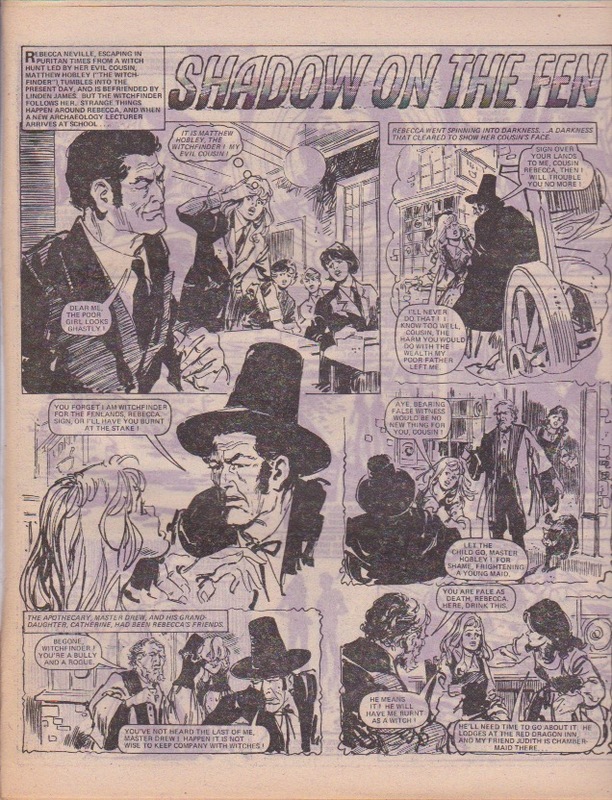 Ye Editor was flooded with requests for a detective story, hence Mike Temple (makes a change, having an adult male as protagonist in a Jinty serial) and his assistant Terry (a woman) on the trail of a master criminal known as “The Shadow”. This must have taken inspiration from “The Zodiac Prince”, which had a similar pairing that proved extremely popular. Meanwhile, Pandora wants to be rid of the cat she was obliged to magically bind to her in order to make her box work because she hates cats. But it looks like she’ll have to learn to tolerate the cat instead. Maloney thinks the Lilliputians are leprechauns and is out to catch them. And the Lilliput children are in big trouble on a river. Linette’s hatred of Dad’s fans is driving her to run away from home, which can only lead to big trouble for her too. And in “The Disappearing Dolphin”, Paula and Chris are having problems overcoming local hostilities to their expedition. But it looks like they’ve got an ally at last, with something in his boot that can help them. In “The Forbidden Garden” Laika discovers that destroying Gladvis’s blackmail evidence is now paying off dividends in a most surprising manner. The headmistress Miss Karvell was among the people she freed, and Miss Karvell has been her secret helper in return. (Pity Gladvis is still in business, using her position as prefect to collect more blackmail evidence to use on pupils and teachers alike.) However, the forbidden garden yields a surprise that is not so pleasant – Laika discovers that the plants she had been cultivating for her dying sister are not beautiful flowers but hideous mutants! The indignity the Lilliputians suffer in this issue makes the cover, and the complementary use of orange and green on the cover makes it even more striking. The silly things thought a sandcastle was for living in, and have been hung up to dry after the soaking they got from the sea. 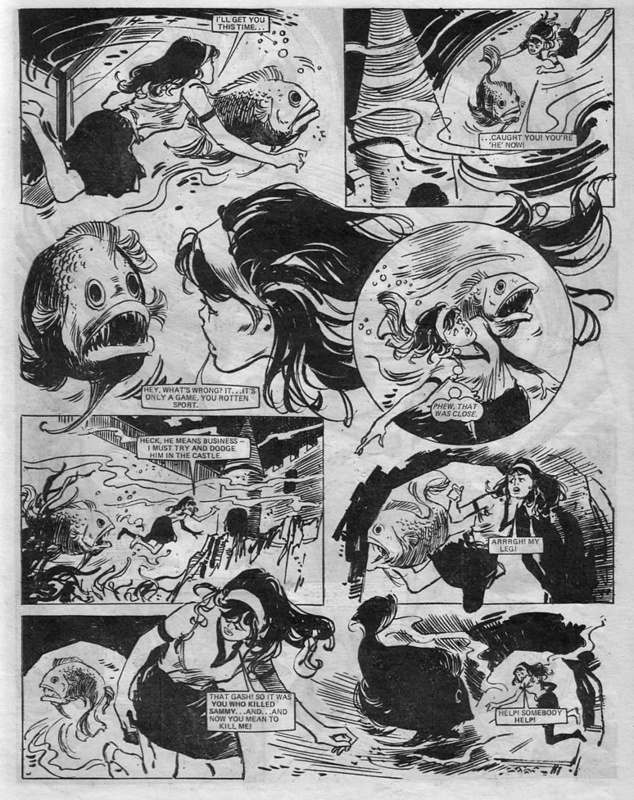 This Gascoine story certainly had several cover slots, no doubt because it was such a fun, upbeat story (unlike the next story Gascoine will draw – “Waves of Fear” – which is one of Jinty’s most disturbing stories). This issue is one for Doctor Who fans because it has an exclusive interview with Tom Baker, the fourth Doctor. The text story is unusual too. There are deliberate mistakes in it, and the challenge is to see how good a sleuth you are by picking up as many of the mistakes as you can. Xenia’s inability to touch Earthlings without killing them causes real problems as she tries to help some people with an accident. The district nurse is getting suspicious. 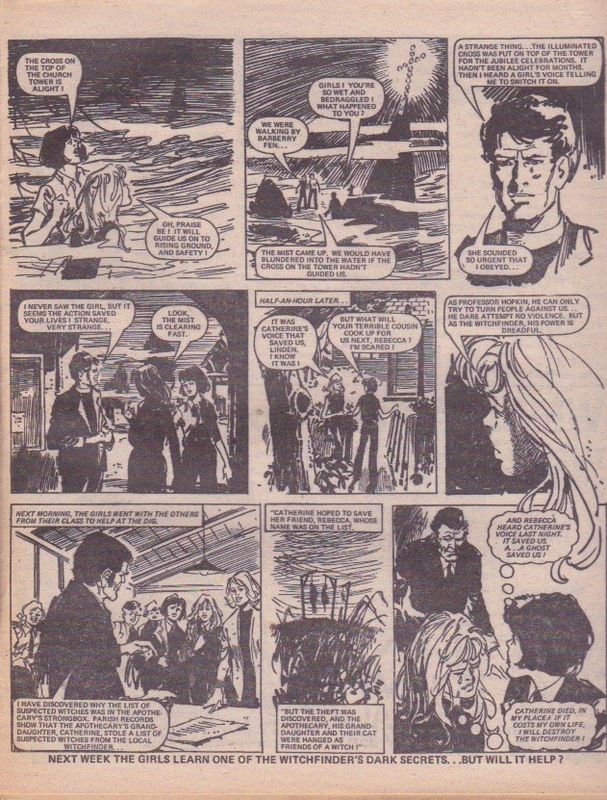 Sue does not trust Mr Grand’s scheme to use her village as a location for a television serial. And when she discovers just how he is filming it (cameras everywhere and stirring things up to create action), she declares war on him. Mike and Terry are out to stop a plot to kidnap a ventriloquist, and Mike is turning conjurer to do it. But at the end of the episode he looks like he could do with a disappearing trick when the kidnappers accost him. In “The Disappearing Dolphin”, Paula and Chris think they’ve worked out who is plotting against them – Mrs Ormerod-Keynes. But now they need to work out why and how. It’s the penultimate episode of “Nothing to Sing About”. Linette has now been put straight about the cause of her father’s death and realises she was wrong to blame the fans. But her bitter behaviour beforehand has had serious consequences – it wrecked her mother’s new engagement. Pandora works another spell to get what she wants – a job in a commercial. But she finds a conscience when she discovers it cost Ruth her chance of getting it, and she badly needed the money because her father can’t pay the school fees. Douglas Perry is an artist whose style will be recognized by most readers of girls comics as he has had a very prolific history of drawing for IPC/Fleetway and for DC Thomsons across many decades. I think of him as a Jinty artist because he drew two particularly striking serials for this title, and a number of Gypsy Rose stories too. In fact however the bulk of his artistic output was clearly done for other titles, particularly IPC’s Tammy and DCT’s Bunty. As my particular memories of Douglas Perry are from his spooky stories in Jinty, I want to illustrate this post with some pages from 1978’s “Shadow on the Fen“; they show his distinctive style (loose but effective) well, and give a chance to shiver at the creepy atmosphere he brings to life. You can see from the above that Perry’s art has a lot of movement and energy in it, with some lovely touches in the composition, like Rebecca’s hair breaking the boundaries of the panel in the last page. Listing supplied by Mistyfan in comments below – many thanks! See also this discussion thread about him on the Comics UK Forum, which includes some example art uploads. 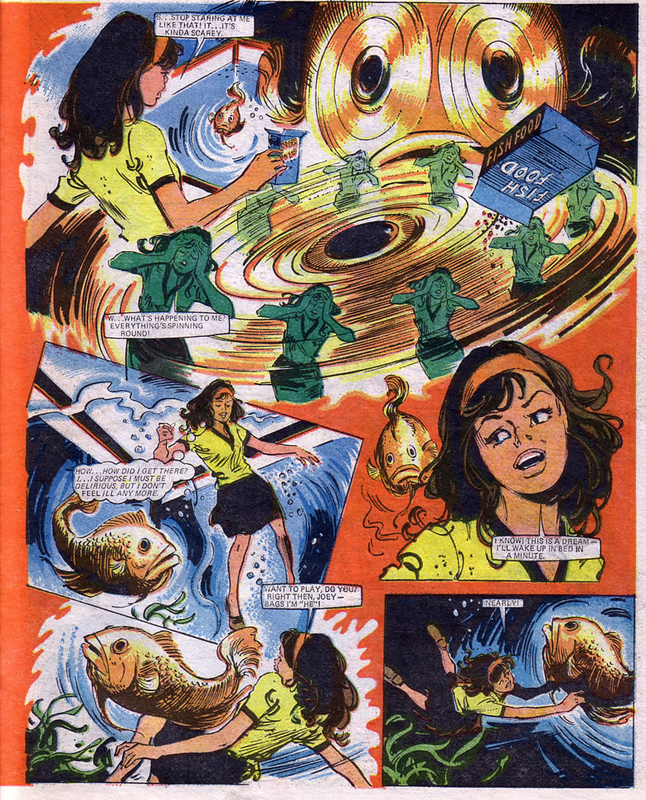 The Girls Comics of Yesterday site, which focuses on DC Thomson titles, also has a Douglas Perry tag. Here is a Catawiki tag list too. I am sad and surprised to see how little information there is available about this fine artist on the internet. There is nothing on Bear Alley, or the UK Comics Wikia entry, nor even anything on Lambiek’s Comiclopedia. I suppose we must count ourselves lucky that Perry drew for Tammy during the years they were running credits. As ever, further information (particularly in order to add to the Bibliography) would be extremely welcome. 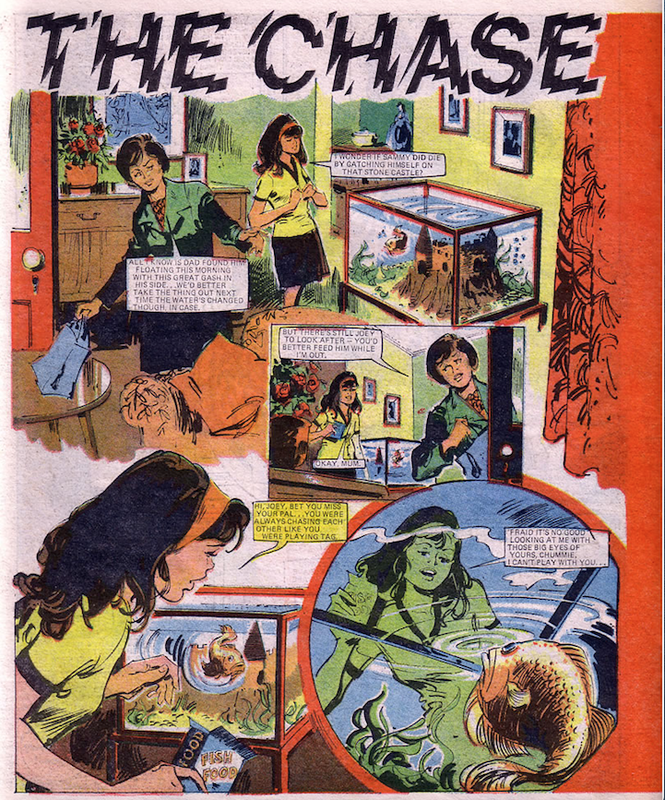 Edited to add: Mistyfan has sent through scans of the Misty story that Perry drew: “The Chase”. It is a great spooky tale and I include it here to show more of his artwork. It looks like girls’ comics portray a very wide range of roles for girls and women – perhaps wider than is the case in some recent mainstream media targeted at a girls’ market – and that boys and men are integrated into that world of girls as well. The roles that boys and men are shown as playing are not as wide-ranging as those that girls and women are shown in, but compared to the representation of other groups such as Black and Minority Ethnic characters, boys and men get much more of a look-in. What about boys’ comics? What sort of representation do they have of girls and women? Do boys and men get as wide a range of representation in the comics targeted at them as a market? The second, perhaps more major, caveat is to reiterate something I said in earlier posts: this test says nothing about the quality of the individual story or comic, and was never intended to. A story can be great entertainment, excellently written, touching and humane, exciting and innovative, while dealing with a very small subset of humanity or the human concern. The problem comes when only a small subset of humanity is used as the usual channel for stories – when no one else gets a look-in and it is not even questioned. The overall range of stories that are told ends up narrower, but also a wide range of people – those not included in that selected small subset – are implicitly told they are not the stuff of stories. To repeat again, please do not take the comments below as a negative judgment of the comics I am looking at – I can see the stories are exciting and well crafted. That’s exactly why it’s important to apply an analytic test that doesn’t talk about the way the story makes the reader feel or whether it’s well-done – to look at an aspect of the story or comic that can otherwise get hidden by those subjective judgments. I was able to look at: four issues of Battle Action dated between March and April 1980, and one issue of Battle and Valiant dated December 1976, all five of which were published by IPC. I have grouped these under the heading ‘War comics’ above, coloured green. 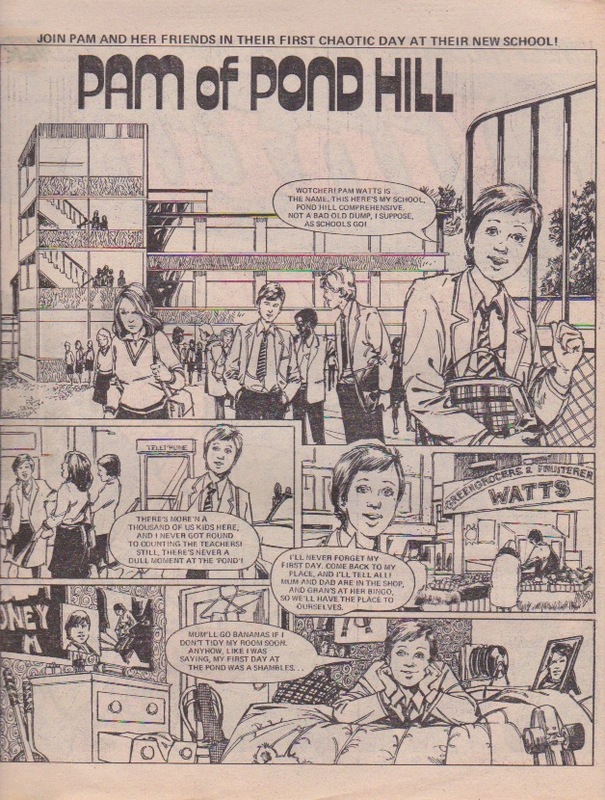 Not all boys’ comics are about war as a genre, I appreciate, and thankfully I also had an individual issue of a more general comic that featured a wider genre range – DC Thomson’s Spike, dated 26 November 1983. I didn’t look at humour comics (which weren’t marketed in as gender-specific a way) or at the action adventure comics of an earlier age. Other notable omissions are the weekly publications with a more overtly didactic element and an implicit seal of parental approval – Eagle, Look and Learn, and the like. The copy of Spike also does not have any stories that pass the Bechdel Test: a couple of the stories had mothers mentioned or shown, but again none of the female characters were named. 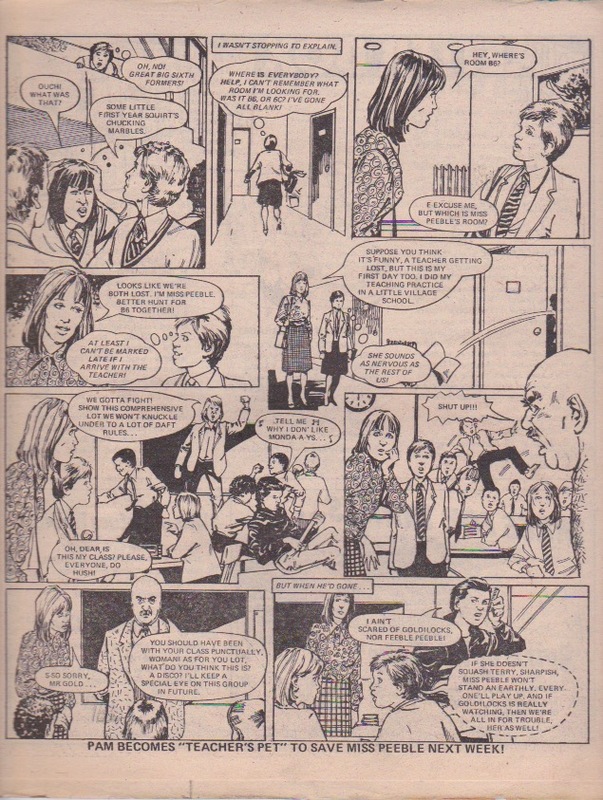 It felt like slightly less of an exclusively male world on show; balanced against that though, the nurses in “The Black Crow” were professionals with roles of their own, rather than generic wives and mothers, so perhaps honours are even. In any case, it’s easy to see that girls and women are considerably less well represented in these boys’ comics than is the case for boys and men in girls’ comics. Even in publications that include a lot of fantastical stories, girls stories are not set in an exclusively female world; boys and men are given parts that are more than purely token. 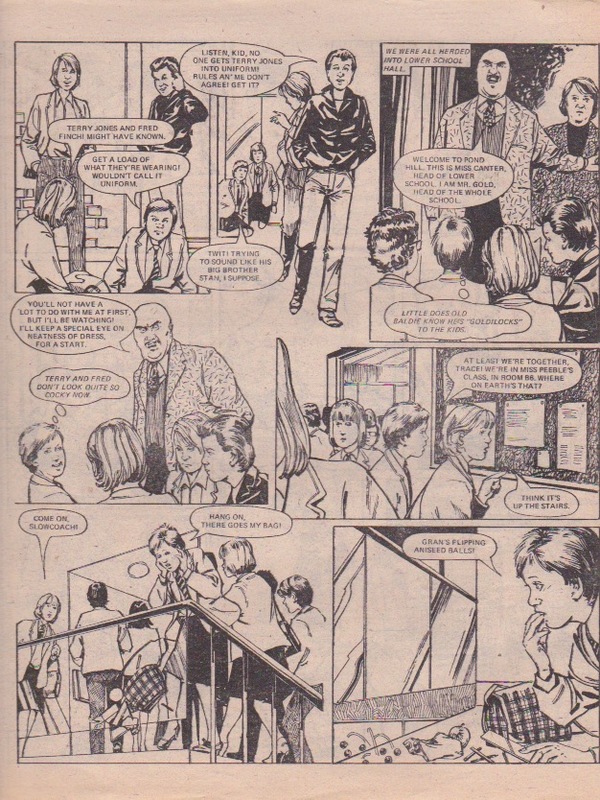 Not so in (these) boys’ comics. I have therefore not gone through the Rounded Representation test looking at depiction of girls and women in boys’ comics. What of the roles that boys and men are depicted in, in these publications aimed at them? 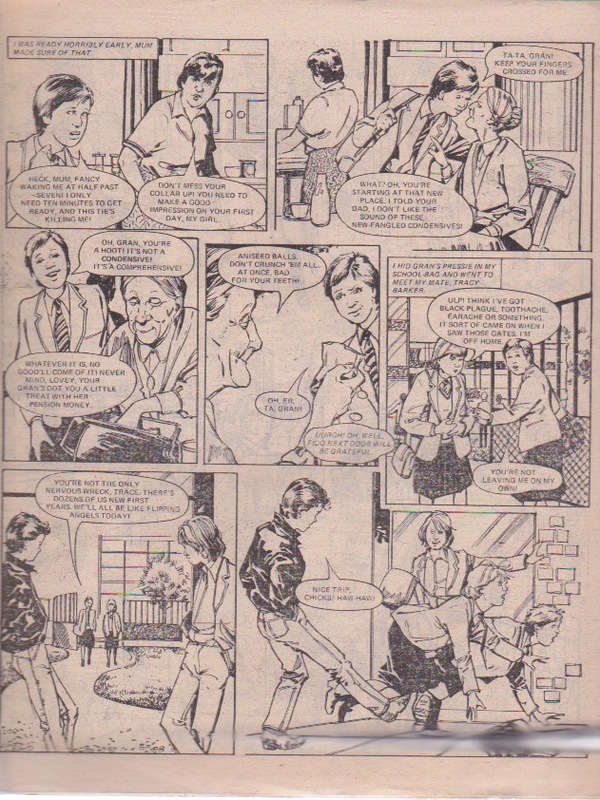 Now here’s an interesting thing – in terms of representation, boys are actually slightly hard-done-by in their ‘own’ comics, more so than in girls’ comics. That will need a little more teasing apart than the simple ticks in the various cells above show, however (which is also often the case with the Bechdel Test). 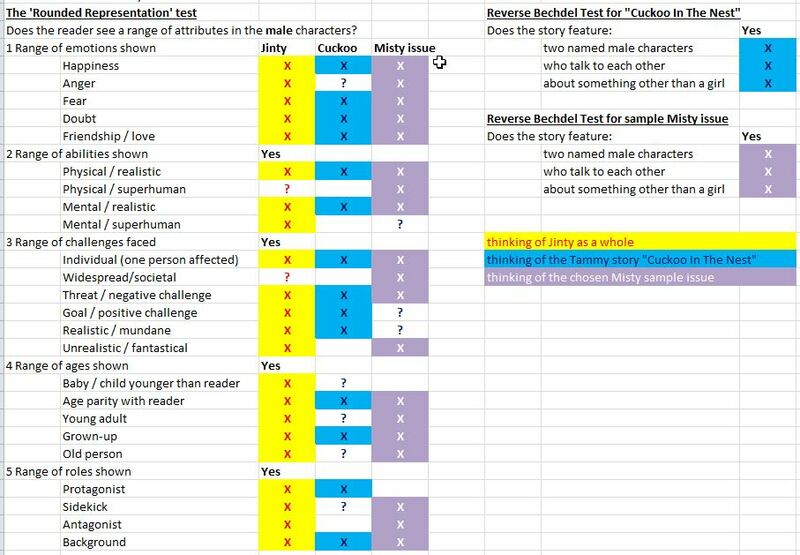 So, let’s look at the Rounded Representation test as applied to male characters in boys’ comics. 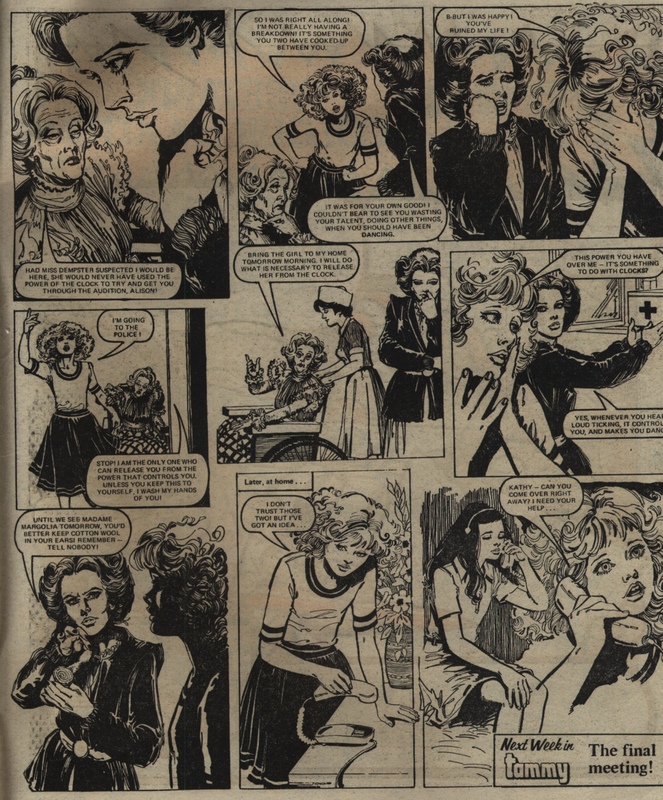 Emotions: in both the war comics and the individual issue of Spike it was possible to find depictions of the range of emotions. I must say though that it was a lot easier in the single issue of Spike; in the war comics it took me looking through most of the pages before I was able to find much in the way of happiness. There was a lot of fear and doubt, and friendship wasn’t hard to find (D-Day Dawson ready to sacrifice himself for his buddies, Jimmy Miller trying his hardest to win Machine Gun Cooley’s friendship). Happiness, and even anger, weren’t anything like as prevalent though. I felt like the tone was a fairly steady and grim one: not many highs and lows of emotion overall, other than perhaps fear in particular. Challenges: as mentioned earlier, the war comics I looked at are pretty focused on realism so there are no fantastical challenges faced by the protagonists. And while World War II is clearly a society-wide threat if ever there was one, I didn’t feel that the protagonists’ roles in these stories were really about trying to stop the whole war, they were much more specific than that. There were of course plenty of threats in the war comics, driving the story along; fewer positive goals, but I counted Jimmy Miller’s quest to win Machine Gun Cooley’s friendship as such. Spike includes fantasy and realism, individual challenges and wider-spread ones, and a few positive goals as well as external threats (a group of inner-city kids work hard to start a City Farm, and Wilson has a visitor who wants to be made into a champion decathlon athlete). Ages: neither the war comics nor Spike show any very young children – baby brothers or suchlike. Not very surprising in a war comic, but there were no families escaping the horrors of war or similar – the focus was pretty narrowly on the soldiers themselves, hence on young adults and grown ups. The story in Battle and Valiant mentioned above, “The Black Crow”, features old men in a nursing home, and expands the range of ages noticeably. Spike, once again, is wider in its range than the war comics and ticks most of the boxes fairly comfortably. Roles: so few of the characters are female that there is hardly any way that these comics couldn’t have featured men and boys as all of the range looked at: protagonists, sidekicks, villains, and background characters. 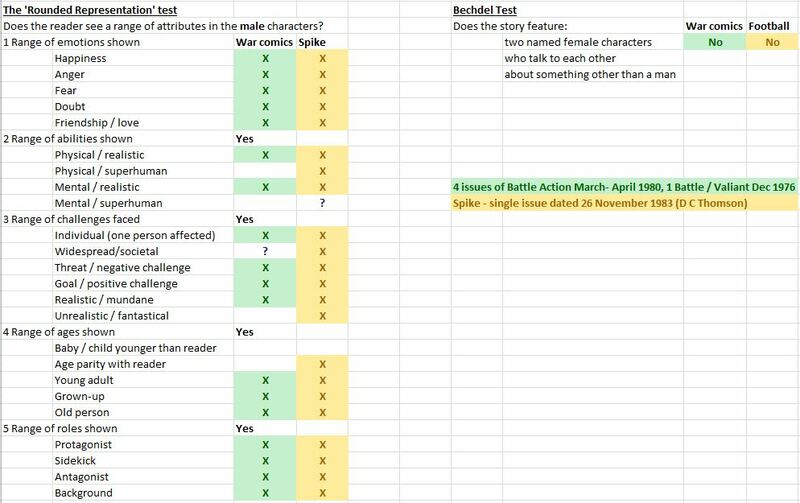 Overall, the Rounded Representation test looks like it shows a pretty wide representation of male characters in these boys’ comics, though some of the ticks would have ended up as blank cells if only one or two individual issues had been examined. Certainly some of the result is about genre, with (these) war comics likely to focus on young adults and grown men in a realistic setting, facing individualistic challenges in an overall story tone of fear and anger, with little happiness depicted. Of course in principle war comics could work differently – “Rogue Trooper” is a war story set in a science fiction milieu with an overarching threat to the whole of the world and positive goals based in comradeship as well as threats from external forces. (There’s even at least one named woman in it, though whether as a whole it passes the Bechdel Test I am not sure.) Overall however it is pretty clear that whereas girl readers had their stories set in a world which represented them in a rounded way as people endowed with possibilities both good and bad, boy readers were given more circumscribed stories with a narrower set of options – and very little room indeed for their sisters, mothers, and fierce warrior Leelas.